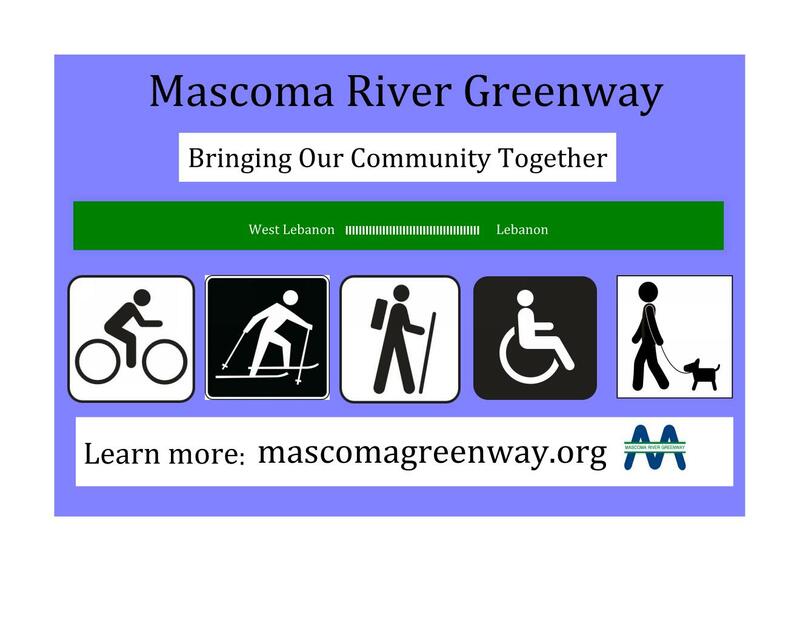 The Mascoma River Greenway (MRG) will be a 4 mile multi-use separated pathway starting from the current terminus of the Northern Rail Trail at Spencer Street in downtown Lebanon, NH to West Lebanon’s Rt. 12-A and Seminary Hill, extending the Northern Rail Trail from its beginning in southern NH. The MRG will be the core transportation corridor for bikes and pedestrians through the heart of Lebanon and West Lebanon, connecting Lebanon’s neighborhoods with workplaces, schools, open spaces, shopping areas, restaurants, a medical center and transit stops. No-cost recreational opportunities: The MRG connects neighborhoods to local parks and open spaces including Riverside Community Park, Colburn Park, the Lebanon Memorial Pool and Eldridge Park and the Witherell Center. It will be available for walking, running, biking, and skateboarding . . . and in winter, to x-country skiing and snowshoeing. Transportation benefits: The MRG provides easy connection to short term destinations like shopping centers, parks, restaurants, and grocery stores without the need for a car or public transportation. Some connections include Miracle Mile, downtown West Lebanon and downtown Lebanon, for all of your local hot spots. Economic development: A study of the Burlington (Vermont) Bikeway and Island Trail Line found that tourist expenditures associated with the trail were in the range of $1-2.5 million for a five month period in 2008 (UVM Transportation Research Center). Trails have also been found to increase property value with recent home buyers ranking proximity to a trail second in importance out of 18 possible neighborhood amenities when shopping for a new home (Rails to Trails Conservancy). 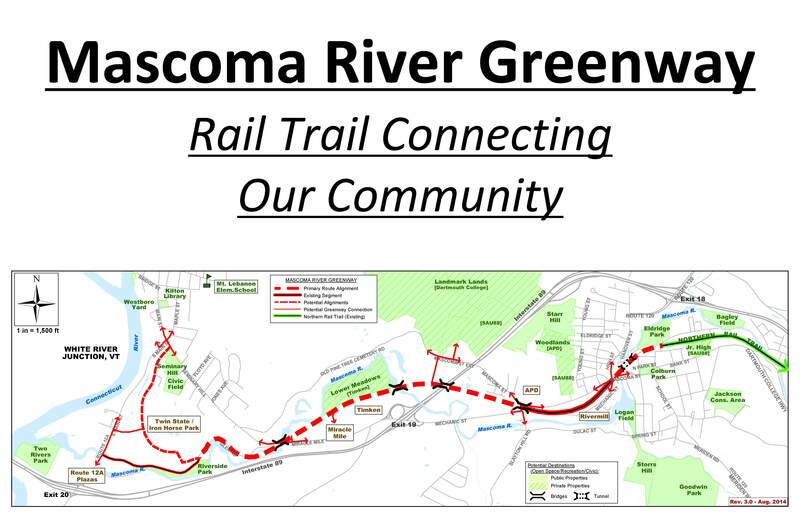 Conservation benefits: The MRG improves air quality by taking cars off the road and will enhance appreciation for the natural resource that is the Mascoma River. Thank you Lorraine Kelly for your piece in the VN Forum, dated 12/29/15, on behalf of the MRG campaign team. I was thrilled to learn of the progress being made on the greenway project and delighted to know that you’re close to reaching your fundraising goal. I’ve been rode cycling for years thus understand, first hand, the importance of this project. Linda, Thank you for your encouraging response. All of us on the campaign team appreciate your understanding of the importance of the Greenway to the cycling community of the Upper Valley. Many generous donors continue to move us towards reaching our fund-raising goal in the very near future. We are delighted to count you among them. Wow ! Excited to hear more about this project as it progresses . . .